In many sub-Saharan African countries, the poultry and fish industries are among the fastest-growing agribusinesses. However, poor availability and the low quality of feed, combined with the high cost of soybeans and cereals used as feed ingredients, are severely constraining growth in the sector. This situation is reflected globally, where the cost of feed ingredients has doubled in the last five years. In looking for a sustainable solution to this challenge, a priority is to identify alternative sources of protein, the most expensive element in commercial feeds. Insect protein is one option. In West and Central Africa, researchers have documented the use of termites, house flies, and cockroaches in poultry feed, but little research has been done in Eastern Africa on the use of insects as an alternative protein source for livestock. The project developed and tested insect-based feeds for the sustainable, safe, and cost-effective production of fish and poultry. Researchers identified suitable insect species and tested insect rearing and harvesting techniques that are suitable for local, small-scale farming systems. Working with private sector companies, the research team assessed the market potential for insect meal and insect-based feeds and analyzed the feeds’ performance in poultry and fish production. The project worked with the Kenya and Uganda Bureaus of Standards to develop regulations and standards for the use of insects in animal feeds. Ninety-two percent of the 28 profiled insect species have higher crude protein (dry matter (DM) basis) than fishmeal available in Kenya and Uganda. All of the species reared by the project were superior, including the African moth (Gonimbrasia zambesia), which has up to 73.3% crude protein (DM basis), field cricket (67.21%), house cricket (62.57%), and black soldier fly (49.5%). Insects are also high in polyunsaturated fatty acids, flavonoids, vitamins and minerals. Aflatoxin and pesticide residues were not found in the 28 insect species analyzed. Pathogens (Escherichia coli, Salmonella typhi, Staphylococcus aureus, and faecal coliforms) in reared black soldier flies (BSF), crickets, and harvested blue caliphora flies were effectively inactivated by boiling or roasting for five minutes. Rearing protocols for 16 insect species were developed, the most productive colonies being BSF (Hermetia illucens), crickets (Acheta domesticus and Gryllus bimaculatus), locusts (Schistocerca gregaria), silkworms (Bombyx mori), and American cockroaches (Periplaneta americana). Performance studies in catfish fingerlings revealed that a 37% higher growth rate and a 23% higher weight gain were achieved from BSF-based feed, compared to conventional feed. Nile tilapia fish fed with BSF-based feed were 23% heavier than those fed with conventional feed. Replacement of 20% fishmeal in conventional poultry feed with BSF resulted in higher (53%) egg production and improved quality compared to conventional feed. Insect use as a protein source is estimated to reduce the protein cost of feed production by at least 25-37.5%. Insect commercialization for feed has been adopted in both countries. For instance, Sanergy Ltd., one of the private sector partners involved in the project, is currently expanding its BSF production units with new investors joining the venture. Over 80% of interviewed fish and poultry farmers and 75% of feed traders and processors are willing to use insects as feed. Effective demand, at 5% inclusion of insects in feed, translates into 27,000-32,000 tons of dry insect material for Kenya. Further, at 5% inclusion, the substitution of current protein with BSF in poultry feed alone in Kenya represents a potential demand of 115,000 tons of dry insect per year, translating into a market value of US$103.5-115 million (CA$138.9-154.3 million) per year. This would potentially result in 14,328 jobs if each person produced 2 tons of fresh insects per month. The production of BSF in a screen house of 5 m x 10 m could yield 2 tons of fresh BSF per month, costing US$0.20/kg (CA$0.27) (DM) to produce, and sold on the market for between US$0.90 and US$1/kg DM (CA$1.21 - 1.34). Insect rearing is a sustainable practice that can be carried out from home with minimal required inputs. It is therefore ideal for women farmers who are often constrained by limited access to agricultural resources. Gender-equitable capacity building for the next generation of scientists and experts in the field of insects for feed, and the provision of equal opportunities for young scientists, were top priorities and achievements of the project. 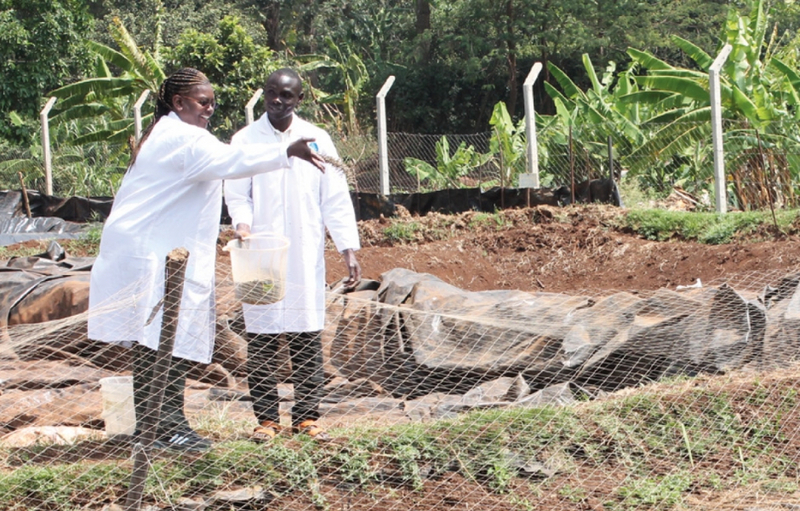 The training of young women researchers in the areas of insect mass rearing, and nutritive profiling, has enabled them to build their scientific capacity and use the project as a platform for professional growth. With women making up 52% of the project’s postgraduate students, the project has provided a platform for these young researchers to grow professionally. A standard for Dry Insect Product for Compounding Animal Feed was approved and launched by the Standard Approval Committee in Kenya in March 2017, and in Uganda in June 2017. This will enable small, medium, and large-scale feed producers to integrate insects into feed production and create a market for women and youth to mass rear insects as a business. Institutional and scientific capacities for insect use as feed and food built in Kenya and Uganda will ensure continued research and sustainability. A total of 506 (293 men and 213 women) farmers, young entrepreneurs, policymakers and scientists were trained on insect rearing for integration into animal feed. Insect-based feed technology has the potential to contribute to job creation and income generation through the establishment of insect mass rearing, processing and trading businesses, improved egg and meat productivity, and organic fertilizer commercialization. Future dissemination of insect-rearing technologies to a wider audience, and follow-ups with trained agripreneurs, will be required to scale up the inclusion of insects in livestock feed across the continent.